Cappy, an example of a Bonneter. The Bonneters are a race of hat-like beings found in the region of Bonneton within the Cap Kingdom of Super Mario Odyssey. They all have Eerie-like bodies, heads shaped like hats, and big eyes with irises of various colors. 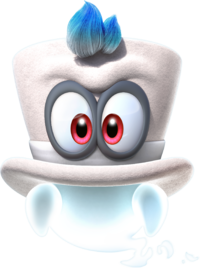 As demonstrated by Cappy, they can also take on the appearances of other hats, such as the Mario Cap, and capture other beings, both animate or inanimate. Male Bonneters have top hat-shaped heads with a more pronounced eyebrow ridge while female Bonneters have cloche hat-shaped heads with ribbons and wingtip eyelashes. The first quest appears in the Sand Kingdom, Metro Kingdom, Snow Kingdom, Luncheon Kingdom, and Mushroom Kingdom, and is called "Hat-and-Seek". This quest has the player looking for Bonneters who take the form of other people's hats, similar to Cappy. Talking to that person with the Bonneter in it will award the player with a Power Moon. The second quest involves a Bonneter biologist who appears in the Wooded Kingdom, Lost Kingdom, Snow Kingdom, and Bowser's Kingdom, and will require the player to approach it while capturing an Uproot, Tropical Wiggler, Snow Cheep Cheep, and Pokio respectively to gain a Power Moon. Like many of the supporting characters, Bonneters will cower and refuse to talk to Mario if an enemy gets too close to them, regardless whether Mario has captured the enemy in question or not. A male Bonneter with yellow eyes. A male Bonneter with green eyes. A male Bonneter with blue eyes. A female Bonneter with yellow eyes. A female Bonneter with green eyes. A female Bonneter with blue eyes. A female Bonneter with purple eyes. The Bonneters resemble and share similarities to tsukumogami, a type of youkai from Japanese folklore. All of the Hat & Seek moons, as well as the Bonneter Biologist moons, only involve male Bonneters. According to the book The Art of Super Mario Odyssey, originally, Bowser was going to be assisted by an evil Bonneter serving as a villainous version of Cappy, allowing him to capture other characters and objects like Mario, but was replaced with a robotic top hat equipped with mechanical boxing gloves in the final game. The original concept for the game's final boss battle involved him Capturing Peach and the two transforming into a Bowser-Peach hybrid. This page was last edited on March 17, 2019, at 01:23.